Unless you've been living under a rock, you've probably heard of Anastasia's Contour Kit! I know, you can find lots of pics and reviews about this palette, but I had to write a review because I'm OBSESSED with this product! This is a must have, my friends! This palette is quite small and compact, which may or may not be a good thing depending of your point of view. Each pan contain 3g of product, but for $52 CDN you have 18g of product (so about the same amount of product of 2 regular sized pressed powders). I personally like the size because it takes up less space and I have everything I need to highlight and contour my face in one small palette. I do wish though that the pan was larger because I can't swirl a large powder brush in it. 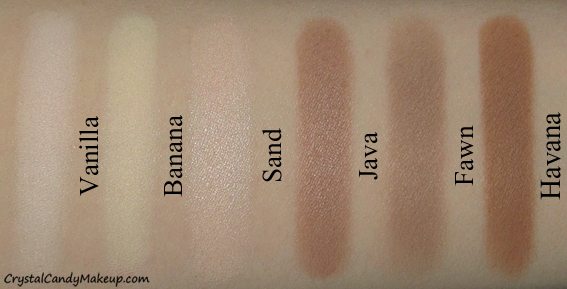 All these shades are matte except Sand, which is a beautiful shimmery beige luminizer! 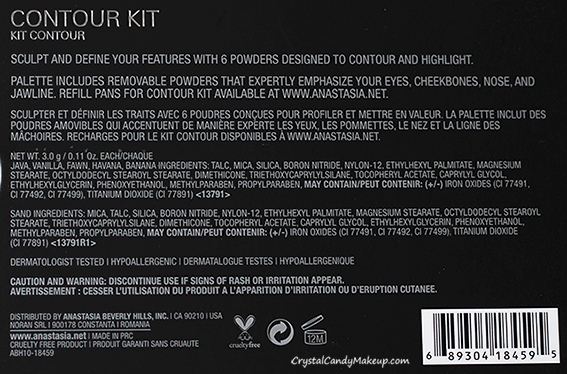 None of these powders look chalky (not on my skin tone anyway) or patchy, and the darker shades are highly pigmented. To highlight my face and set my concealer when I'm tan (NC30/NC35), I like to swirl my brush in Vanilla and Banana! (It's the perfect golden light beige) When I'm not wearing any self tanner though (NC15/20), I only use Vanilla because Banana can leave a not-so-flattering yellow cast. These powders add a bit of coverage (I love that! ), but keep in mind that it might look less natural than a loose translucent powder. Fawn is a medium taupe, the best contour powder I have ever used in my life. Benefit Hoola looks golden compared to it. MAC Sculpt is a bit lighter and has pinky beige undertones. 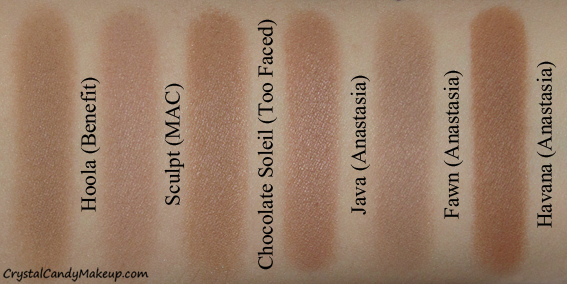 Java is more taupe than Too Faced Chocolate Soleil, more pink toned. The Balm Bahama Mama is less pink, more brown. I like to use Java as a bronzing powder! Havana is similar to Too Faced Chocolate Soleil, but more warm toned. This is the only shade I don't like, too orangey for me. You can't order the Contour Kit at Sephora anymore, but you can purchase it on anastasiabeverlyhills.com (they ship to lots of places around the world, including Canada). Also, you can buy refills and choose the shades you prefer! If you buy 6 refills, you will get them for the price of 3 ($40 US, to be exact) and a free black palette to place them in. This contour kit is awesome, I would purchase it again without any hesitation even if I will not use Havana. 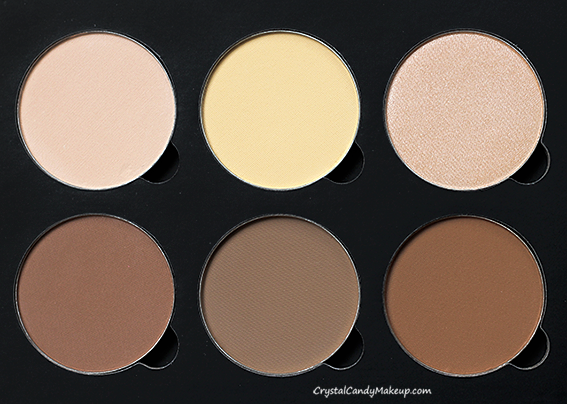 If you want to create your own palette, I highly recommend that you get Fawn, Sand and Vanilla if your skin tone is light to medium like mine! 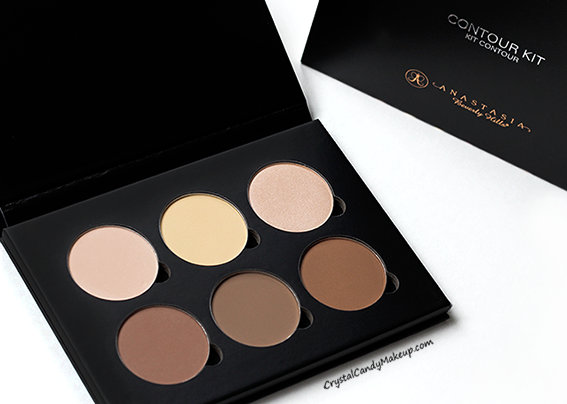 The Anastasia Beverly Hills Contour Kit retail for $52 CDN for 18g (6 x 3.0g). No sorry, I have never heard of that brand!